With the CBC’s stubborn refusal to deal with or disclose the conflict of interest faced by its BC Legislative Bureau Chief, Alex Tsakumis and I took the issue to our readers. We did the task that should have been handled long before by Stephen Smart’s press gallery colleagues or, failing that, by the rest of the corporate media. Our reporting led to formal complaints filed with the CBC Ombudsman. Kirk LaPointe proceeded with Merv Adey’s well argued presentation, one that dealt fairly with principles and avoided arguments based on tastes or personalities. This was a smart choice since citizen Adey has no axe to grind, no publication to promote or scores to settle. The CBC Ombudsman, a man with irrefutable qualifications and long media experience predictably agreed that Stephen Smart’s situation was untenable. The public broadcaster’s local management refused to admit mistake and, defying the Ombudsman, they stood on crumbling ground. Still do. What followed has been a scandalous display of obtuse reasoning and commentary from Good, Leslie, Palmer, Baldrey, Mickleburgh and other Stephen Smart colleagues. From the rest, media lights like Gary Mason, Justine Hunter, Michael Smyth, Les Leyne and Rob Shaw, there has been only the silence of cowards. This week, two of British Columbia’s most eminent veterans of journalism, Mike Cleaver and Harvey Oberfeld, weighed in on the issue. Read Harvey’s The CBC’s Dumb Saga of Mr. Smart. Mike Cleaver provides the first reader comment. Another illustrious media expert commented on the CBC situation this week. Recipient of the Bruce Hutchison Lifetime Achievement Award in 2007, Jim Harrison speaks with unusual expertise. An extraordinary BC broadcaster is the 2007 recipient of the Jack Webster Foundation’s Bruce Hutchison Lifetime Achievement Award. 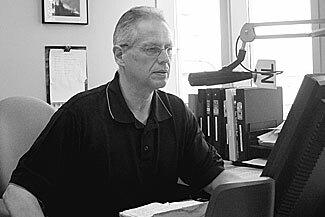 Jim Harrison has defined news radio in Kamloops for more than three decades, where he has been CHNL’s News Director since 1975. And his reporting has in turn helped to define Kamloops itself to people all across Canada. …George Garrett, retired CKNW reporter and himself a Bruce Hutchison recipient, says Harrison’s great strength is the “credibility he’s earned with every newsmaker he’s covered, from politicians to labour leaders and community activists. He earns people’s trust, and that’s why he’s got their home phone numbers. Soon, Stephen Smart will be shifted to other duties because the CBC cannot survive by offending fundamental rules of news presentation. Hundreds of journalists are tainted by this regional anomaly; it cannot continue. However, British Columbians will be left with this sad group of practitioners, especially the Corus/Global/Shaw and Postmedia wretches, who are so focused on serving their pals, they care little about the interests of news consumers. While searching the web, looking for comments by hallowed members of the Victoria Press Gallery about the CBC conflict, I came across an item from June, 2011: The Media Are The Messengers. I must admit, since I read everything by blogger RossK, he must have planted the seed in my mind those many months ago. I’m not sure exactly when AGT got on the subject but I’m going to cede a greater share of credit to The Gazetteer for exposing the broadcaster’s folly. Hats off to Ian Reid as well. He wrote about the subject last summer at The Real Story. Economic development whatever the cost! “…But this brings up the topic of other members of the media who have spouses or partners who also are receiving money from the provincial government. Sure would be interesting to hear some specifics in that regard, I reckon. Perhaps I should have made clear that The Tyee reported fully and fairly on the CBC Ombudsman's finding in the Smart/Scott situation. Kudos to Andrew MacLeod, one of the truly reliable reporters from Victoria. Agreed about Mr. McLeod's piece which was out the very same afternoon that the Ombudsman's report was released if I recall correctly. And for the record, and giving credit where credit is due, I'm pretty sure AGT was onto this thing quite a bit before me for all kinds of reasons, including the fact that he is much more plugged into the Lotuslandian media zeitgeist than I ever will be. Also: in the past, my blog has had some memorable squabbles with Kirk LaPointe who, in his embedded life at Vancouver Sun, was stubbornly in favour of whatever Vancouver Sun said or did. You can search my blog THE LEGISLATURE RAIDS for his angry and dismissive periodic eruptions. I was truly astonished — and pleased — to see Kirk's response to the Smart-Scott issue. Just sayin, if he has taken on some ethics himself, he's a guy who might be helpful in the broader sense of challenging unethical journalists. Another possibility Mary is that his work for the Vancouver Sun reflected exactly what the management of the newspaper demanded. Perhaps he was uncomfortable with his role and went elsewhere for employment. LaPointe's current position is structured specifically to give him freedom to say what he thinks. That would not have been the case when he worked for the Sun. BTW, left not long after the formation of Postmedia.